California Governor Jerry Brown has been talking tough about California's growing drought crisis. In January he declared a state of emergency saying, "I'm calling on all Californians to conserve water in every way possible," and just last week he announced that we are "in a new era" of drought severity. But while his rhetoric was rightfully alarming, his solution, a mandatory 25% reduction in household water consumption, overlooks the largest users of water: animal factory farms. Under this plan, the entire state could become as barren as the Dust-Bowl-like stretch of Interstate 5 drained by the Harris Cattle Ranch feedlot. That's why the Animal Legal Defense Fund is drafting a petition for rulemaking to address that omission in California's outdated water laws. To be sure, California's drought demands action -- within a year, a senior water scientist at NASA warns, California's aqueducts will run dry. But, the governor's plan not only falls short in conserving water, it unfairly places the burden on individual consumers and non-agricultural businesses. California's constitution, in Article X, Section 2, requires that all uses of the state's water be reasonable and beneficial. But is it reasonable to restrict household use, while allowing factory farms to continue their wasteful business-as-usual practices? According to the Pacific Institute, agriculture accounts for 80% of California's total water usage, including alfalfa, the crop that uses the most water, and which is used to feed farmed animals. 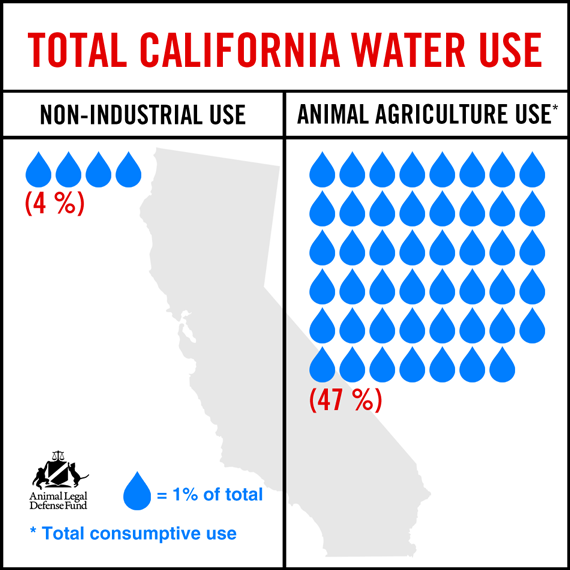 Meat and dairy alone account for a whopping 47% of California's consumptive use of water, which means that water has been extracted and cannot be replaced. The environmental footprint left by factory farming from water use (as well as land use, greenhouse gases, energy use, and health problems), is part of the reason the federal Dietary Guidelines Advisory Committee recently recommended that Americans eat less meat. Under Brown's executive order, the State Water Resources Control Board will require mandatory reductions in water uses like watering lawns, drinking water, taking showers which combined only constitute 4% of the water California uses. Even if we make the 25% cut in household use the emergency plan requires, we will have only curtailed total water use by approximately 1%. Simply put, household water use is a drop in the bucket. We can stop showering, stop watering our lawns, and stop ordering water in restaurants, but the water used to raise and slaughter millions of cows, pigs, and chickens in California will still drain the state dry. During a drought, industry water use must be subjected to closer scrutiny. Californians have prioritized the fair use of water in the state constitution. And, as reflected in the state's anti-cruelty and farmed animal protection laws, Californians have prioritized the humane treatment of animals. In re-evaluating state priorities, factory farms must be held to the same scrutiny as we hold ourselves. As Governor Brown said, "people should realize we are in a new era." But the state's current plan keeps the old era intact for animal factory farms by not requiring them to change their wasteful water usage at all. It is within California's legal rights to require thirsty industries to reduce waste, and as the world watches the Golden State's water evaporate, it's time to exercise that right.